This is the best midsize crossover for you if you’re ready for the next stage in the evolution of the Santa Fe. Model-year 2019 marks the debut of the fourth-generation Santa Fe and a return to its standing as a five-passenger wagon after sharing its name with a seven-seater in an ill-advised marketing experiment. Its design represents a nearly clean break with its predecessor and heralds the future look and engineering of Hyundai crossovers for 2020 and beyond. This South Korean automaker hit the right notes when sculpting the 2019 Santa Fe. Its face is bold enough to be distinctive against more staid rivals such as the Ford Edge. At the same time, its edges are not so overdone that it might put off potential buyers – see the upcoming 2019 Chevrolet Blazer for an example. It heralds what’s likely the future of midsize five-seat crossovers by abandoning six-cylinder power for an all-four-cylinder lineup. 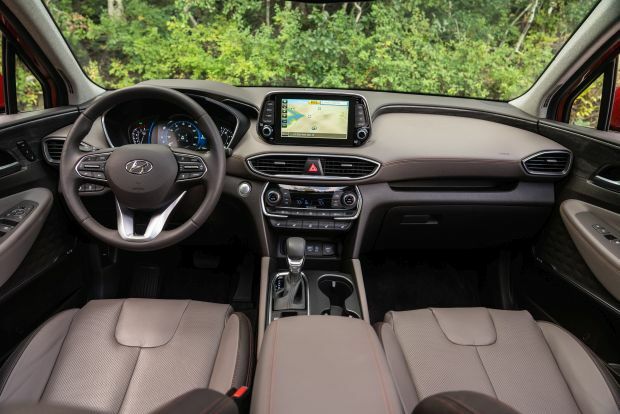 And, surprisingly, the base Santa Fe SE is worth considering if you’re on a budget, thanks to its generous standard equipment, including Apple CarPlay, Android Auto, blind-spot alert with rear cross-traffic detection, drowsy-driver alert, and a full suite of advanced driver-assistance features, such as automatic emergency braking with pedestrian detection, lane-departure alert with automatic steering correction, forward-collision warning, and adaptive radar cruise control. We’ve seen SUVs morph from essentially pickup trucks with enclosed beds into stylish wagons that rival many cars in terms of driving dynamics. Hyundai’s first-generation Santa Fe, released for the 2000 model year, was at the forefront of the change from truck-type SUVs to car-style crossovers. It might have looked strange and wasn’t the most refined on the road, but that vehicle won favor with buyers for its spacious interior and lots of convenience features at reasonable prices. This formula generally remained the same over the next two Santa Fe design generations, released for model years 2007 and 2013. The latter was slightly problematic for the brand because it launched two distinct versions, a three-row seven-passenger one called Santa Fe, and a shorter five-seat variant called Santa Fe Sport. This confusing lineup likely cost the brand some sales. Buy a 2019. Hyundai scuttled plans to offer a diesel engine in the Santa Fe, citing a lack of consumer interest. As such, expect no substantive changes for model-year 2020, although the price is almost certain to rise. The ’19 lineup will almost certainly carry over, consisting again of seven trim levels, from the entry-level SE to flagship Ultimate, with SEL, SEL Plus, and Limited grades in between. All will have a four-cylinder engine and the choice of front-wheel drive or traction-enhancing all-wheel drive (AWD). As for Santa Fe’s dual identity, it’ll conclude with the ’19 model year. While Hyundai redesigned the five-seat Santa Fe (dropping the Sport designation in the process), the larger seven-passenger model continues for 2019 as the Santa Fe XL. It retains the same basic styling and engineering as the 2013-2018 seven-seater. In summer 2019, Hyundai will replace it with an all-new, larger eight-seat crossover called the Palisade. Its styling mimics several elements of the 2019 Santa Fe, but it has more upscale detailing. It should be worth checking out if you need the extra room. 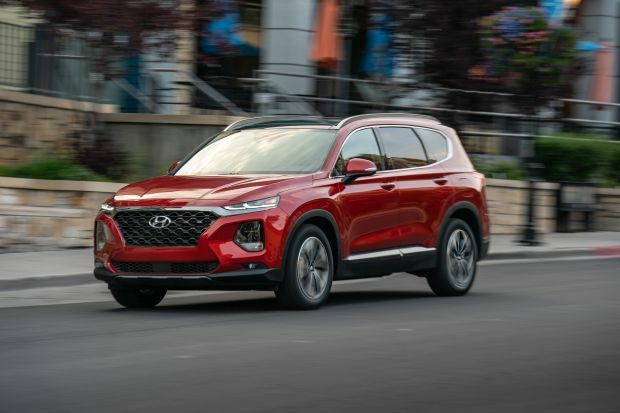 Styling: Despite being all-new, you’ll find several familiar Hyundai-family styling elements on the 2019 Santa Fe, most obviously narrow, angular headlights and an inverted hexagonal grille flanked by large fog light cutouts. Stylists employed them creatively enough to give the Santa Fe its own identity, complete with smooth body lines wrapping to a back end that looks more like that of a German-brand luxury SUV than a mainstream crossover from East Asia. Santa Fe’s interior is similarly modern. The SE uses a traditional instrument cluster that’s clear and logical. SEL and above have analog secondary readouts flanking a digital speedometer/multi-information display. You could say designers cribbed the overall look from the Honda Pilot, but don’t consider that a bad thing. There’s a lot of available information you can conveniently access via the controls on the steering wheel. Also well realized is the infotainment system. Apple CarPlay and Google Android Auto are standard across the board. Imbedded GPS navigation is exclusive to the Ultimate, which has an 8-inch tablet-like touchscreen display. All other models have a 7-inch screen, which looks a bit small perched atop the expansive dashboard. The instrument panel’s sweeping curves make the front seating area feel airier and more spacious than in most other five-seat crossovers. The buckets are comfy and supportive and there’s enough headroom, even beneath the housing of the available panoramic sunroof, that even the very tall will feel royally accommodated. Rear seating is another highlight, the bench wide enough to fit three moderately sized adults in reasonable comfort – another rarity in this competitive set. At 35.9 cubic feet, cargo room behind the rear seat is quite good for the class, as well. Hyundai augments this with usefully sized under-floor bins. Capacity increases to a class-average 71.3 cubic feet when you lower the rear seatbacks. Mechanical: In the future, we expect all five-passenger, midsize crossovers to abandon six-cylinder engines in favor of four-cylinders. Santa Fe is on trend, coming standard with a 2.4-liter four unit of 185 horsepower and 178 pound-feet of torque. Available on Limited and Ultimate is a 2.0-liter turbocharged four-cylinder with 235 horsepower and 260 pound-feet of torque. No examples with the 2.4-liter engine have been made available for us to test, we suspect it won’t make for lively acceleration in a crossover that can weigh nearly 4,000 pounds. Spring for the 2.0-liter turbo if you budget allows. Based on our tests, it won’t pin you back in your seat, but it has more than enough juice to handle the full range of driving demands. An eight-speed automatic is Santa Fe’s sole transmission. We criticized its poor shift quality in the Kia Sorento, a V-6 midsize crossover produced by Hyundai’s corporate cousin. No complaints about its performance in the turbocharged Santa Fe. It shifts smoothly and promptly, allowing the smaller engine to stretch its legs on the highway. Only in high-speed passing maneuvers might you miss a V-6’s extra cylinders. After enduring years of criticism for floppy suspension tuning and vague steering, Hyundai has the formula nearly nailed in the ‘19 Santa Fe. The ride is surprisingly firm, with an almost Honda-like quality. This Hyundai tracks down the road confidently, with bumps causing nary a shudder or unwanted secondary motion. We wouldn’t call this crossover athletic, but Santa Fe corners with no excess body lean. And steering feel that won’t leave you wondering what the front tires are up to. The available AWD system includes a console button to lock in a 50/50 front/rear torque split at low speeds. Outside noise is a non-issue. The turbo engine sounds refined while accelerating and fades to near silence at cruising speeds. Despite a somewhat tall and blocky build, there’s remarkably little wind rush. Features: Hyundai merits credit for the responsible decision to give buyers of even the entry-level Santa Fe trim the full protection of a wide range of safety features. As mentioned earlier, these include autonomous emergency braking with pedestrian detection, lane-maintaining automatic steering correction, adaptive cruise control, and blind-spot and rear cross-traffic detection. Moving up to the SEL model nets a more high-tech instrument cluster, power driver’s seat, and heated front seats. SEL Plus grades add 18-inch wheels (up from 17s), rear-obstacle detection, dual-zone automatic climate control, and a 630-watt, 12-speaker audio system. Among top-line versions, the Limited has full LED headlights, leather upholstery and a power panoramic sunroof. Ultimate is fully loaded, with rain-sensing windshield wipers, a driver’s seat with 4-way power lumbar, an adjustable leg cushion, and two-position memory, ventilated front seats, heated outboard rear seats, 8-inch infotainment screen with built-in GPS mapping, head-up instrument display, surround-view camera, and wireless smartphone charging. 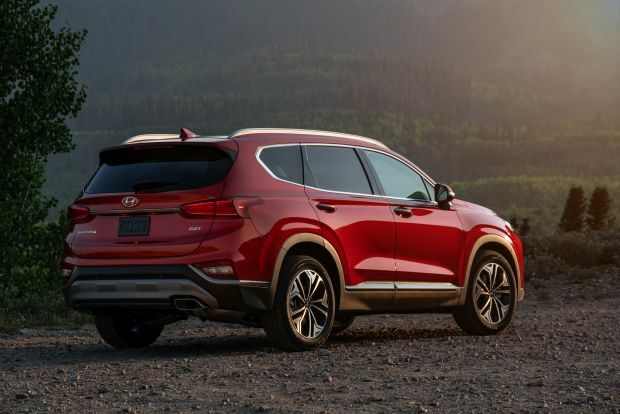 Hyundai streamlines pricing for the 2019 Santa Fe, offering distinctly equipped trim levels but no factory options except AWD. This simplifies the manufacturing process but might force you to make some difficult decisions about which model you may have to choose to get the creature comforts you value. Prices here include Hyundai’s $1,045 destination fee. To them, add $1,700 across the board for AWD. With front-wheel drive, the 2019 Santa Fe SE is priced at a very reasonable $26,545. List price jumps to $28,645 for the SEL and to $30,845 for the SEL Plus. Limited and Ultimate grades with the 2.4-liter engine are priced at $33,645 and $36,495, respectively. A turbocharged Limited with front-wheel drive carries a sticker price of $35,245 while an Ultimate with the same drivetrain is $38,145. If you don’t need AWD and can live without a few convenience features, the SE is an exceptional value. Otherwise, our picks in this lineup would be an AWD SEL Plus or Limited turbo. Despite its lack of a V-6 engine, Santa Fe’s EPA ratings are nothing special. Models with the 2.4-liter engine rate 22/29/25 mpg city/highway/combined with front-wheel drive and 21/27/23 with AWD. The more powerful 2.0-liter turbo rates 20/25/22 mpg with front drive and 19/24/21 with AWD. Our turbocharged AWD Ultimate review sample returned 24.5 mpg over the course of an evaluation that consisted mainly of long-distance highway travel. All 2019 Santa Fe models use regular-grade 87-octane gasoline. Since the automaker cancelled its plans to bring a diesel-powered Santa Fe to North America, don’t count on any major changes in the near term, especially since company product planners and marketers will be focusing on the larger Palisade. Still, the launch of the current-generation Santa Fe was well-timed considering the midsize, five-seat crossover market will get more competitive with the upcoming Chevrolet Blazer and Honda Passport. Nissan mildly freshened its Murano for 2019, too. The stalwart Ford Edge is long overdue for a clean-sheet redesign, but that’s unlikely before model-year 2021. Santa Fe’s first significant styling and/or feature update will likely arrive for the 2022 model year.